Be a lover of the marrow of things, a joyful greeter of the green shoots, an excited ear to the birdsong at five a.m. Take your miracle hand and give succor to another, letting the heat of your smile warm like the sun. It isn’t the big glorious idea that will evolve us into what we long to become. What will grow us into a mature family of humanity is the tender touch, the warm smile, the open door, and the willingness to tell the truth of our simple, everyday lives. Life grows in lovers in the simple moments when, between the inhale and the exhale, we’re fed by breath and our minds rest in the swell of the heart. This is how we change the world. By changing how we are in the world. By coming down into the marrow of things, into the real places of life where the new springs forth. When we change how we are toward the world, the world changes how it is toward us. This existence is symbiotic, one of mutual dependence, one of reciprocity. While there is great suffering in this world, this existence is also one of joy and it is in our best interest to be joyful for this is our nature, too. Being a lover of the marrow of things is not the easy path. It requires a reconsidering of what it truly means to love. Love appears as many things: not nice, but always kind and sometimes very fierce. 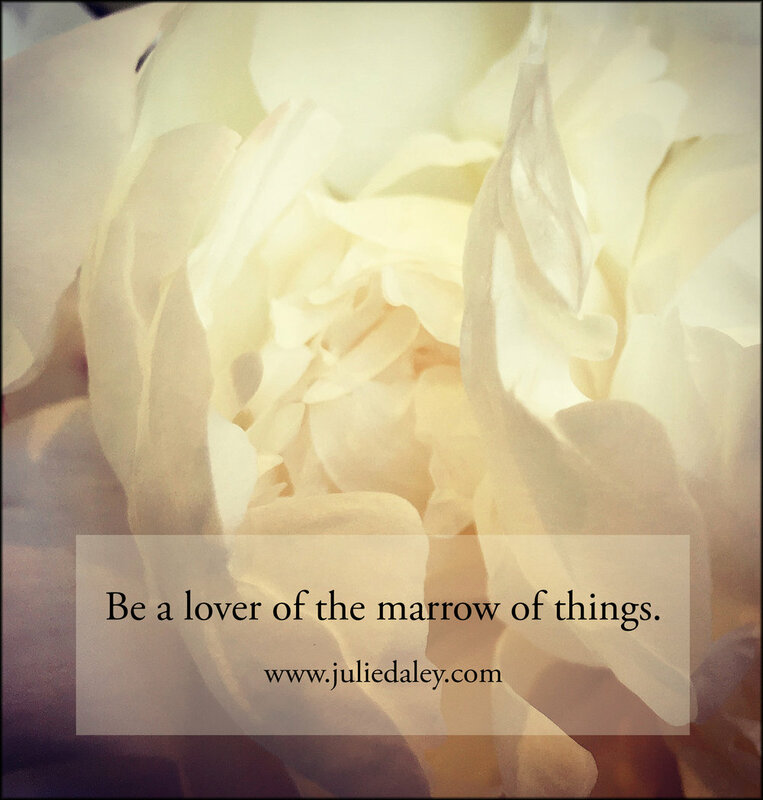 Be a lover of the marrow of things. Come down and in, living close to the bone of existence. Smell the air in all its sweetness. Touch flesh and gives thanks. Begin this succulent journey back home, back into the marrow of life. I’d love to be your guide back into the marrow of your own knowing.